To roast garlic, cut the top off a head of garlic and drizzle with a tiny bit of olive oil and a pinch of salt. Wrap the head of garlic in foil. Roast in a 325°F oven for 30-35 minutes until cloves are very tender. Let cool and remove cloves from the garlic head for use in dish. Peel new potatoes and roughly cube potatoes. Add to a large pot of simmering salted water and cook until potatoes are tender, 15 minutes or so. Drain potatoes and return potatoes to hot pot over low heat. Add olive oil, almond milk, and roasted garlic and mash thoroughly. If you want your potatoes completely smooth, mix with an electric mixer and possibly add a bit more almond milk. Season mashed potatoes with salt and pepper and garnish with chopped scallions before serving. Vegans rejoice! 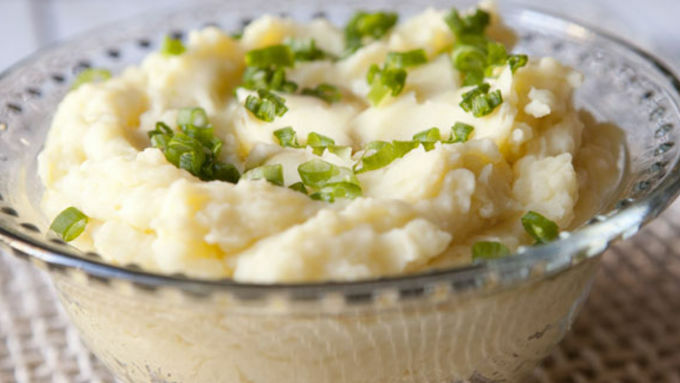 You can have creamy, delicious mashed potatoes without the dairy! Here's one side dish on the Thanksgiving menu that'll make your vegan guests smile. Obviously, if you happen to be vegetarian you have to pass on the centerpiece Thanksgiving dish – the turkey. But if you're vegan, you’ll also have to pass on my second favorite dish in most cases: Mashed potatoes! This is a travesty and doesn’t have to be the case. 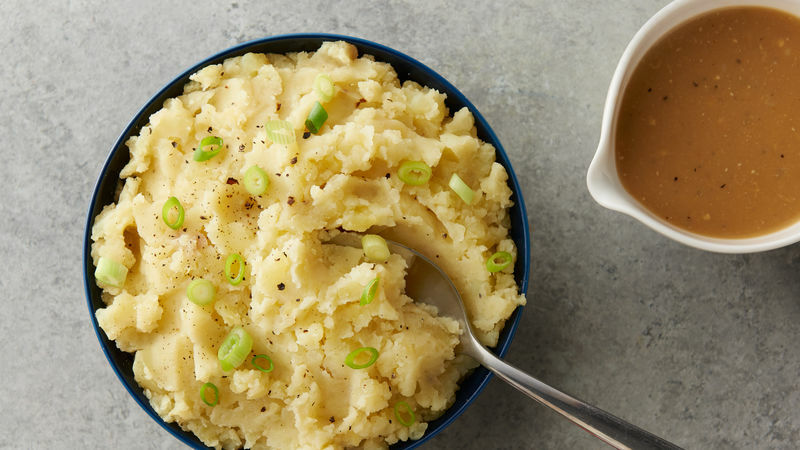 Make a big serving of these Vegan Mashed Potatoes and do a side-by-side taste test with the traditional dairy version. You'll find that you won’t miss the dairy at all! We used new potatoes, which will make a creamier mashed product and have a bit better texture and flavor, but Russet potatoes work great too. 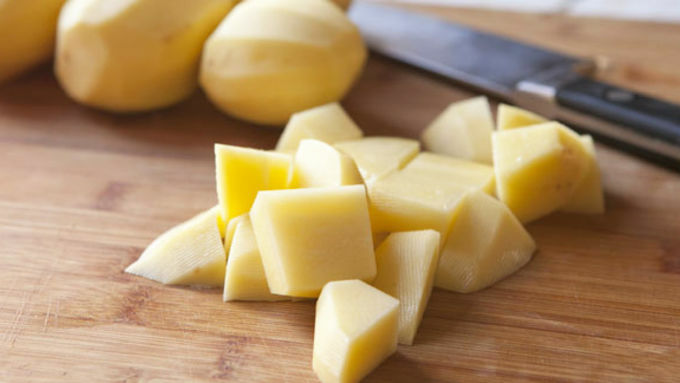 Just peel your potatoes and roughly cube them. If you want a heartier mash, you can leave the skins on. Of course, just because these are vegan doesn’t mean we can’t add all kinds of stuff into the potatoes. Add some olive oil (in place of butter) and almond milk instead of traditional milk along with a few cloves of roasted garlic. 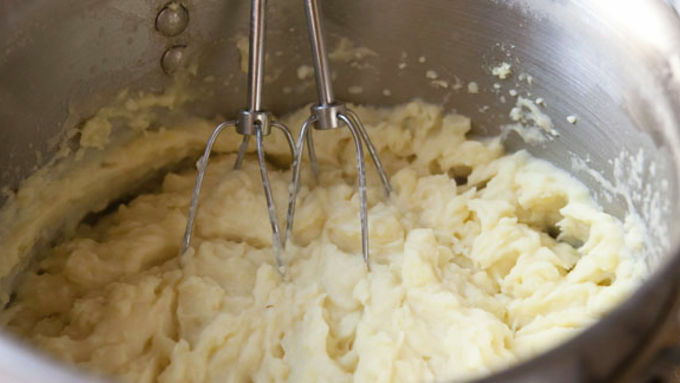 When the consistency is how you want it, season the mashed potatoes with salt and pepper and garnish the served potatoes with chopped scallions. If you happen to be sharing the dinner table with a vegan this year, make this for them and they will forever love you! Here are a few more delicious vegan recipes to treat your vegan and non-vegan friends.